Our stand at the Holz-Handwerk 2018 trade exhibition received more than 1,000 visitors. This means that the number of registered visitors has doubled compared to 2016. This is proof that the GRASS brand is well respected and appreciated as a trade partner. Dirk Braemer, Managing Director of GRASS Vertriebs GmbH: "The overwhelming frequency of visitors and the positive feedback in personal dialogues confirm our corporate policy: GRASS partners craft-based business." We received an impressive endorsement of this policy. 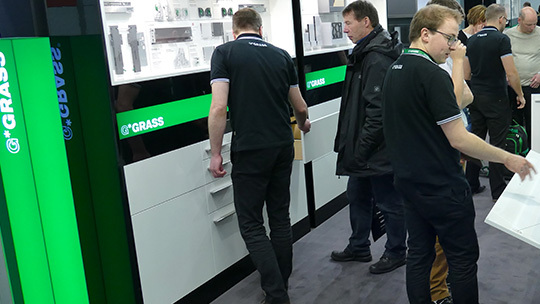 Throughout all exhibition days, GRASS welcomed a continuously strong stream of visitors, which reached its peak on Thursday and Friday. With 1,000 registered guests, the number of customers welcomed in person at the exhibition stand doubled compared to Holz-Handwerk 2016. This year, our planning for the exhibition provided for a balanced mix: visitors were shown application examples in the form of attractive living room and bathroom furniture, and were able to appreciate our informative display cabinets to familiarise themselves with the GRASS movement systems. We also had a workbench where visitors could touch and try out our products. Competent advisers were available to answer any questions. Visitors were looked after in terms of food and drink with some tasty catering options. 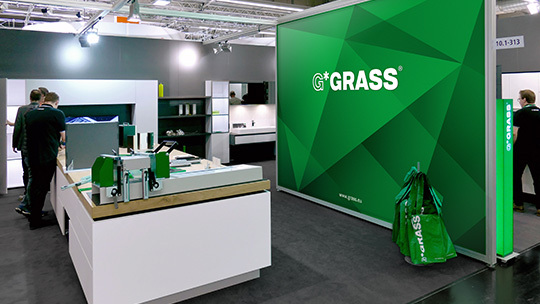 However, the real stars of the stand were our products and the new services: in addition to product highlights, GRASS showcased what was new at interzum 2017, which by now is available in the market. For example, Tiomos H, the new system of "invisible" hinges, which are recessed in the top and base of the cabinet, thereby making cup hinges, mounting plates and serial drilling unnecessary. This innovative form of installation means that the movement system is less prominent compared to the furniture design and – particularly impressive in the case of display cabinets – compared to the content presented in the cabinet. The most important highlight in terms of service was the new GRASS craft catalogue, which visitors were able to take away at the exhibition. The catalogue contains a clear listing of the range of products available to craftsmen. Via QR codes, joiners can learn more about the products from videos and other digital content. Interest was enormous: about 1,000 copies of the smart catalogue were distributed during the exhibition. Visitors were also interested in another service: the newly established consultants’ network operating throughout Germany. Visitors had the opportunity to get to know the team of consultants in person, and to make appointments for further meetings based in one of the GRASS roadshow buses – a type of mobile exhibition – which reaches out to businesses at their own location.